How time flies! One of the most awaited shopping events is just DAYS away! 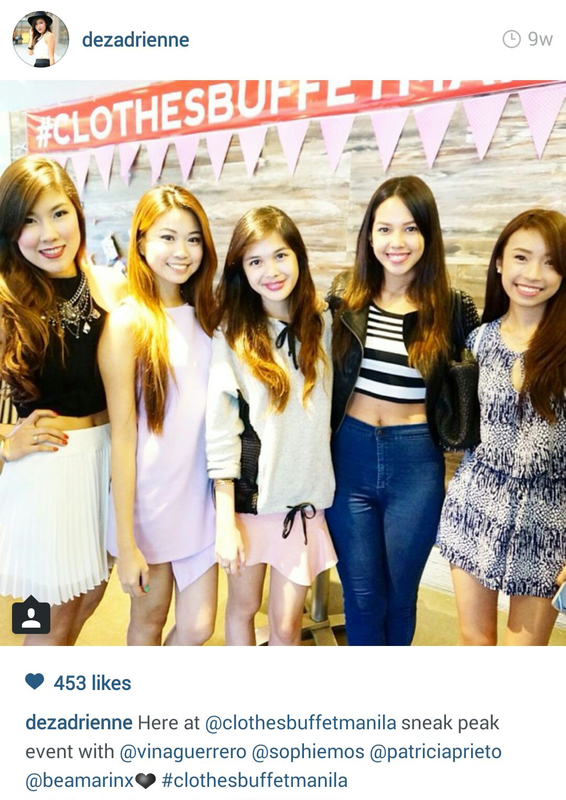 I’ve already blogged about my Clothes Buffet Manila experience here. And from the insaaane amount of comments and inquiries I received, it definitely sounds like a too-good-to-be-true event but the thing is, it’s TRUE & REAL, girls! (This is not a scam!) 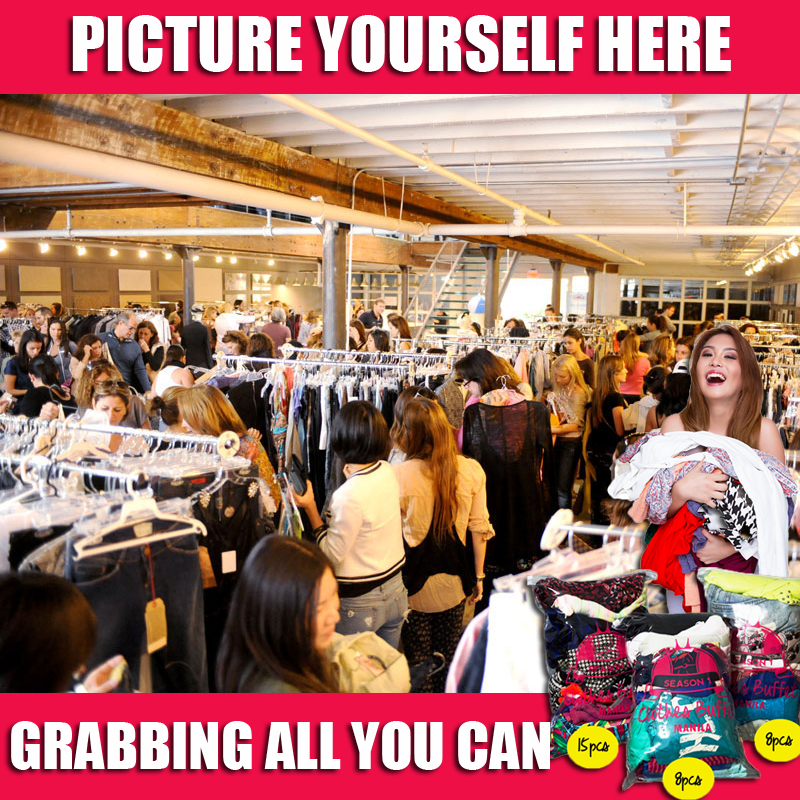 This event is every girl’s dream come true! 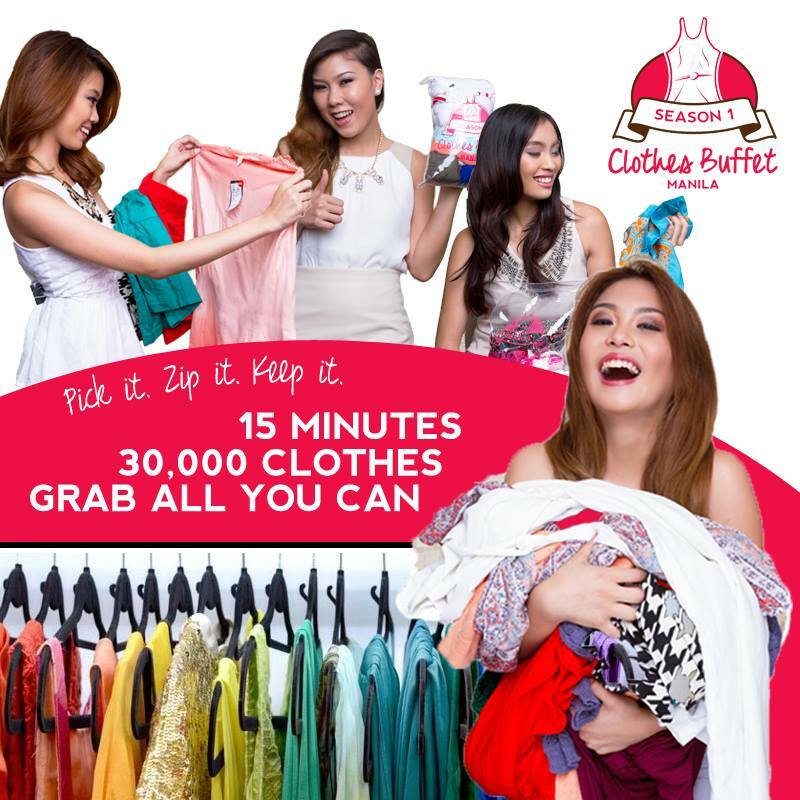 The new talk of the town – Clothes Buffet Manila is bringing its heart-rate-stimulating SHOP ALL YOU CAN experience to Il Terazzo, Tomas Morato for a two-day event (October 17-18) that boasts savings up to P8000! 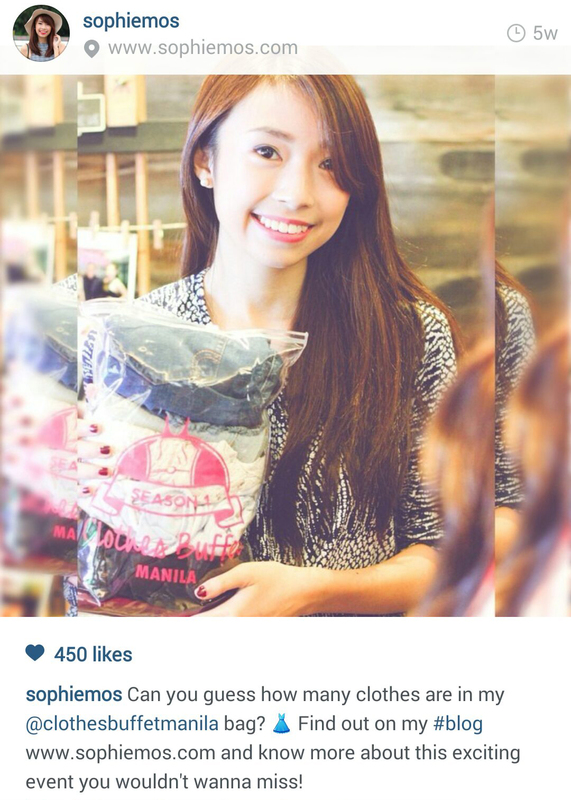 Here are some answers to address some FAQs and comments I’ve received on my post! How much? 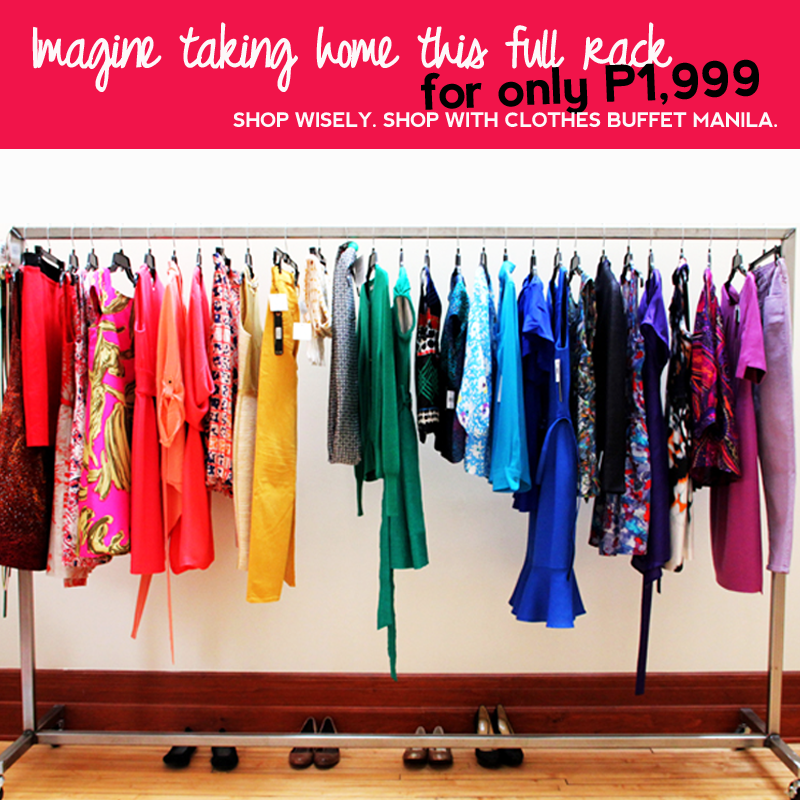 With Clothes Buffet Manila, you can now afford a closet full of new and branded clothes for only one price to pay – P1,999. Yes! This is how it will pretty much look like! Insane, right?? You will be given 15 minutes. You get to PICK whatever you can grab into the buffet bag. You must be able to ZIP the bag and then the clothes will be yours to KEEP! 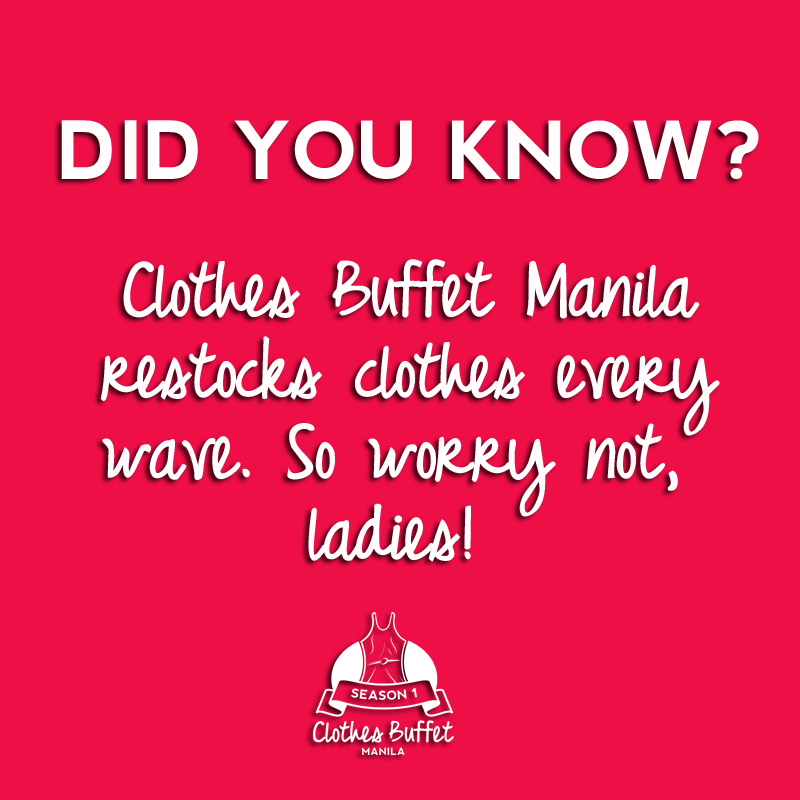 You will never run out of good styles and choices! How big is the bag? It basically boils down to how well you are at your folding skills! Practice packing at home, girls! lol. And that’s not all! More, more and more bags! 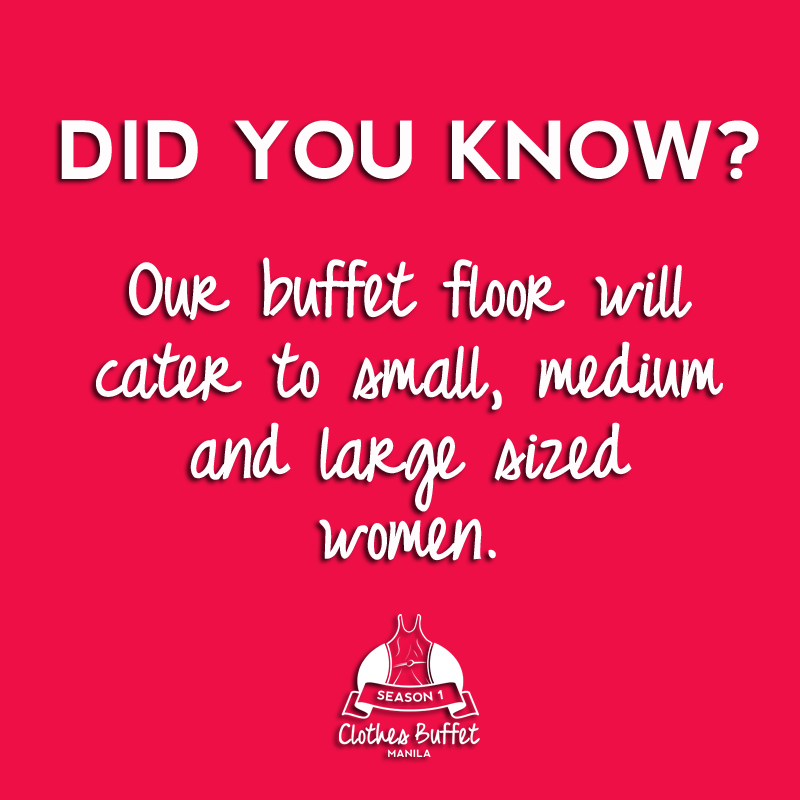 The buffet floor will be filled with exciting finds for the shoppers! Expect planners, gift cheques, beauty products and more! And yes they are FREE for all! Got too many questions on how to book! Booking is so simple! Just head to the link above! Also, get a chance to win prizes from the listed sponsors above if you book during the sponsored waves! 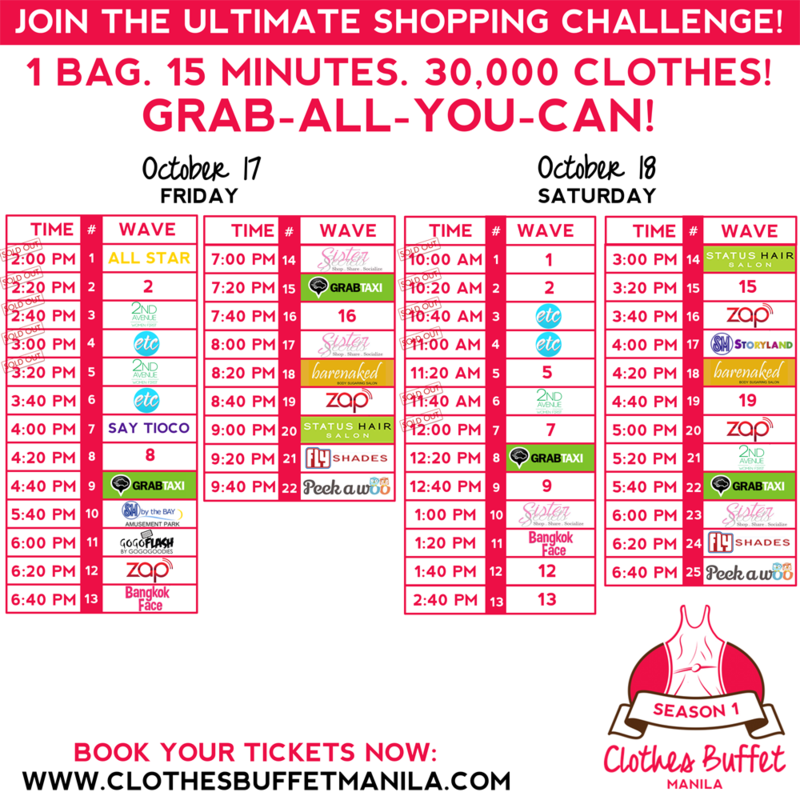 Lastly, after booking, on the day of your wave, here are some friendly shopping reminders! 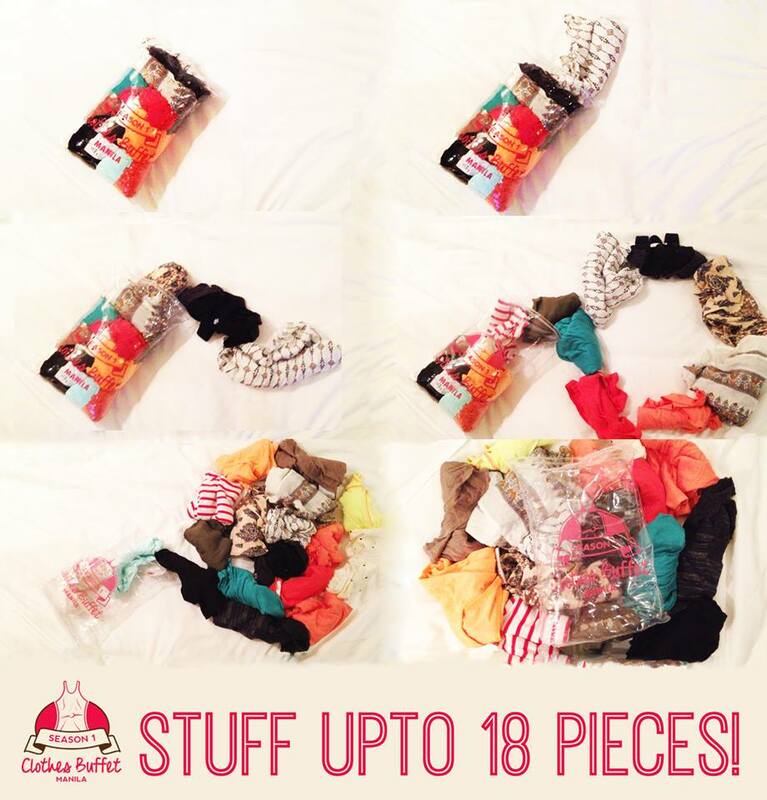 Read through them, promise it will make your shopping experience hassle-free! The organizers recommend wearing light, fitted clothing and shoes that are comfortable. 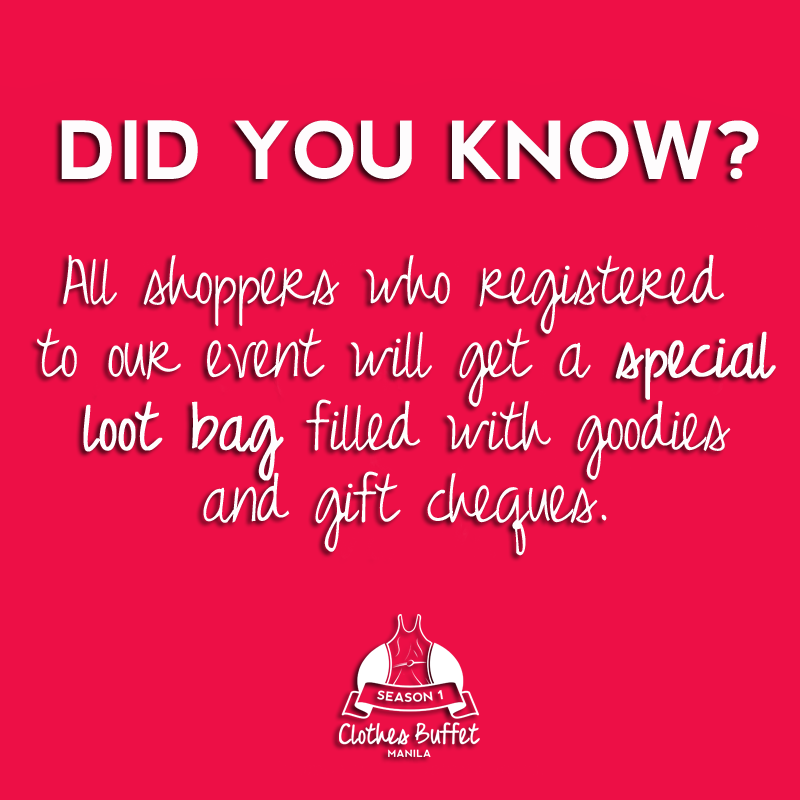 CBM will restrict people from bringing their bags to the buffet floor, so make sure you are wearing something with pockets to store your valuables. Leave that iPad at home! Don’t forget to print, and bring, your ticket voucher. Your ID is a must, too! 4. Don’t become a pirate. Make sure to follow common courtesy and avoiding running to keep the atmosphere sane. Have fun. It’s not supposed to be stressful. It’s a party. That’s all! Wee so excited for this! Hope to see you all there, girls!